Trick or tweet! Is your pumpkin carving scary or sweet? 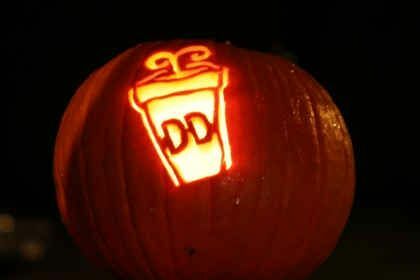 For the second year in a row, Dunkin’ Donuts is excited to celebrate Halloween with its Trick or Tweet #carveDD Contest on Twitter. Inspired by Dunkin’ Donuts’ pumpkin coffee, starting on October 20, 2011, your pumpkin carving skills could help you win an extra “treat” on Halloween – a $50 Dunkin’ Donuts Card! We like the style of this pumpkin carving, created by a family member of ^MG on our social media team! Starting today and continuing through October 30, 2011 at 11:59 p.m. EST, followers of @DunkinDonuts on Twitter are invited to each submit one photo of their own jack-o-lantern creations, using the special hashtag #carveDD. Entries to the Trick or Tweet #carveDD Contest will be judged on originality/creativity (50%), overall appeal (30%) and level of difficulty (20%). Five winners will be announced on Halloween, October 31, 2011, and each will be ‘treated’ with a $50 Dunkin’ Donuts Card. Don’t submit someone else’s pumpkin carving from the web (we’ll be checking!). Don’t enter pumpkin carvings that contain trademarked information, celebrity likenesses, and/or cartoon/TV/movie characters. Don’t enter pumpkin carvings with obscene images/words (when in doubt, keep the profanity out!). Prior to submitting, we encourage DD fans to review our terms and conditions, which highlight the types of pumpkin carvings that we’re not able accept through the Trick or Tweet #carveDD Contest. 'Tis the season for pumpkin! 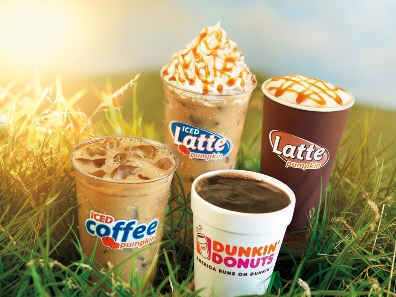 Dunkin' Donuts' hot and iced pumpkin coffee and lattes. Most importantly, we want you to have fun, because that’s what the Trick or Tweet #carveDD Contest is all about. So, grab a pumpkin coffee to keep you running and pumpkin carving! We can’t wait to see what DD fans come up with! To follow Dunkin’ Donuts on Twitter, click here.